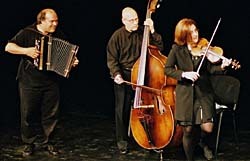 Saturday, April 1, 2007, 10:30 a.m. at Lucille Lortel Theatre: Theatreworks presents Alicia's Klezmer Party. 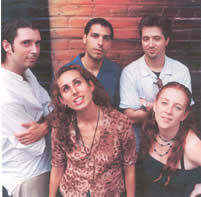 Alicia's Klezmer Party brings the joyful sounds of traditional Ashkenazic Jewish dance music to young ears and feet. World-renowned klezmer fiddler Alicia Svigals, accordionist Art Bailey, and Yiddish singer Magda Fishman raise the roof with hot klezmer tunes and get kids and adults clapping and stamping along. Children learn Yiddish words and shtetl-flavored melodies to sing along and bring home to their own holiday celebrations. Alicia's Klezmer Party brings to life the ecstatic and poignant sounds that must have emanated from Chagall's original fiddlers, a magical journey for kids and parents of all backgrounds. IRON WOLF, named after the legend of the founding of the capital Vilnius, stirs the inspirational pot of Lithuanian music and art into a molten hot night where live music, visuals, electronica, performance art and vodka rise, fall, flow and eddy into a raging torrent, featuring leading Lithuanian Artists alongside Sophie Solomon and DJ Shantel, major young artists from Western Europe strongly influenced by the roots music of Eastern Europe. 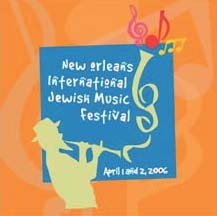 Many of the top names in Jewish music will be performing at the inaugural New Orleans International Jewish Music Festival. The two-day gathering is a celebration of Jewish culture and rebuilding of the New Orleans Jewish community after Hurricane Katrina. The festival will be held April 1 starting at 8 p.m. at The Howlin� Wolf and April 2 beginning at noon at Tulane University�s McAlister Hall. SATURDAY, APRIL 1 AT THE HOWLIN� WOLF ~ DOORS OPEN AT 7:00 P.M. The Saturday, April 1 concert will feature five musical acts. Among those performing are three New York acts: Blue Fringe, a Jewish rock band; Neshama Carlebach, one of Jewish entertainment�s top stars; and internationally acclaimed vocalist Gershon Veroba. Other performers include Californians Sam Glaser (Los Angeles), who has performed to audiences around the world, and RebbeSoul (Oakland), a versatile award-winning musician. Saturday evening will begin with an all-star Havdallah service at 7:45 p.m.
SUNDAY, APRIL 2 AT TULANE UNIVERSITY�S MCALISTER HALL ~ DOORS OPEN AT 12 P.M. The Sunday show will feature a mix of U.S and international stars, including Stacy Beyer (Nashville), an emerging force in contemporary Jewish music; Peri Smilow, a South Orange, New Jersey singer/songwriter, educator, cantorial soloist, and community organizer; Israeli folk singers Susan & Fran; New York�s Voices for Israel, a grassroots charity that uses music to promote Jewish unity and solidarity with Israel; and Yom Hadash (Warwick, Rhode Island), one of the top Jewish recording and touring groups in the U.S. The show will conclude with Ukraine�s Efim Chorny and special guests the New Orleans Klezmer All-Stars. Comedian Joel Chasnoff will host Sunday�s show. The Saturday, April 1 show is $15 and the Sunday, April 2 show is $10. A $5 discount is available for both shows with valid student ID. A $250 patron ticket (reserved seating) is available. A portion of the proceeds will support Jewish education and cultural enrichment activities in the greater New Orleans area. Tickets are available through TicketWeb.com or by calling (866) 666-8932 toll-free. in concert at Knight Club, Powell Campus Center, Alfred University, Alfred, New York, for more info please call (607) 871-2926. An anarchic eclectic night of dirty house, Jewish Klezmer beats and twisted visuals. With a mashup of live and electronic sounds, GhettoPlotz and friends bring Eastern European and Middle Eastern flavours to a rockin' dancefloor. Freiling iz do! Celebrate it with klezmer. Come play music 7-9 pm on Sunday April 2, 2006 at the Workmen's Circle, at 1762 Beacon Street in Brookline, about 5 blocks west of Washington Square, which is about 12 blocks west of Coolidge Corner, right on the Green Line Beacon Street route. 7:00 p.m., in concert at Temple Beth Hillel, 20 Baker Land, South Windsor, for tickets and more information please call Ginny Grossman at 860-658-6143. Tickets £11, £7 concessions. £1 off if bought in advance. Call 020 8985 3724. All ages and dancing abilities welcome. Another klezmer music and dance event brought to you by Hopkele Productions and Jewish Music Central. 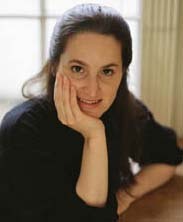 The Yiddish Vinkl Club of the Cleveland Workmen's Circle presents vocalist Lori Cahan-Simon in a concert of Passover songs. Walter Mahovlich will accompany Ms. Cahan-Simon in Songs My Bubbe Should Have Taught Me: A Yiddish Peysakh, on Sunday, April 2, 2006 at 7:30 p.m. at The Workmen's Circle. Tickets are $3.00. Refreshments will be served. Please call (216) 381-4515 to make a reservation. The Workmen's Circle is located at 1980 South Green Road in South Euclid, Ohio, 2 blocks north of Cedar Road. 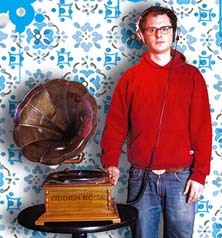 Dor L'Dor will be appearing at The Ark in Ann Arbor on Sunday, April 2, 2006 at 7:30 p.m. Tickets are $15. Special appearances by the University of Michigan Tuba/Euphonium Quartet, and David L. Jackson, Professor of Trombone. Program will include a rare performance of Dor L'Dor's "heavy metal" arrangement of "Hava Nagila." Rock on. This event has been put off until the fall. Tel. 089-54 81 81 81. ערב ספרותי בבית לייוויק יום שלישי 4.4.2006 שעה 20:00 פרופ' דן לאור - ראש הקטדרה לתרבות עברית באוניברסית תל אביב ומרצה בחוג לספרות עברית. ירצה בנושא: דרך הייסורים - דוד פוגל בשנים 1939 עד 1944. פרופ' לאור יציג עדויות חדשות ומסמכים נדירים המתעדים את שנותיו האחרונות של פוגל. בינהם יומן אישי שכתב ומכתבים ששלח למשפחתו ממחנה המעצר בדראנסי. Call 212-989-9319 for more information. The Gerard Edery Ensemble will perform at the Atrium (1000 Harbor Blvd, Lincoln Harbor, Weehawken, NJ) at 12:30 PM. For more information please contact the Hudson Riverfront Performing Arts Center, Inc. at 201-352-1750. The Folksbiene presents Yiddish Theatre songs in an intimate club setting. Drink a L'khayim and listen to new interpretations of old favorites from Gwendolen Burton, exquisite singer from England in her American debut. Sanskrit & Hebrew universal chants celebrating the ONE TRUTH! in this blissful evening of universal chants celebrating the ONE TRUTH. ecstatic kirtan from the Indian tradition. and rhythm to fill you with ahavat olam, infinite love. Friday, April 7, 8:00 p.m., at Donald L. Oat Theater , 62 Broadway, Norwich Connecticut, part of the Norwich First Friday jazz series, presented by the Norwich Arts Council, for more information please call 860-887-2789 or visit www.norwicharts.org. Matt Darriau - alto, clt. Andy Laster - bari, clt. 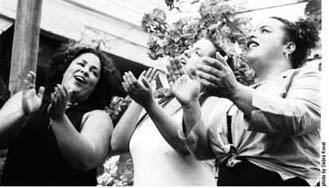 "Let My People Sing:" a groundbreaking Passover festival celebrating freedom, Jewish life, art and culture will be in Los Angeles, April 8-16, 2006. For nine days, Los Angeles will celebrate the glory of Passover. From a Celebrity Seder featuring Danny Glover, Debbie Friedman, Jon Voight and many others to FaithJAM '06, an Interfaith concert of Muslim, Christian and Jewish artists, "Let My People Sing" will bring together tens of thousands of people eager for a unique and inspiring experience. Over ten events city-wide will feature Israeli Super group Hadag Nachash, Rick Recht, Black Jewish Gospel Artist Joshua Nelson, Frank London, Kings of Klezmer and more! Neshama Carlebach is playing on a double bill with Blue Fringe at Makor, 35 West 67th Street (between Columbus and Central Park West), NYC. For more information call 212-413-8800. Shira Kline is performing as a member of the Storahtelling RituaLab: a sacred arena where religious and theatrical narratives blend to create a new conversation and a new place for contemplation and expressions of art, myth, ancient saga for modern times. Includes a children�s service at 10:00am, at The Actors Temple in New York City. I am delighted to invite you to DÜNYA’s Ali Ufki Sacred Music Project, an interfaith concert of Psalms and sacred music coming to the Boston Center for the Arts, Cyclorama at 539 Tremont St, Boston on Sunday April 9th at 3pm. Free admission. This inspirational musical exploration will include 17th c. Psalm Settings in French, Hassidic Nigguns, Turkish Maftirim Songs in Hebrew, Greek Orthodox Hymns, Turkish Sufi Songs and Instrumental Music. 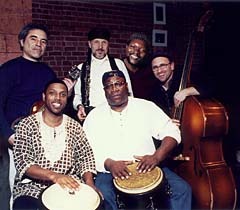 For more information about DÜNYA and the Ali Ufki Sacred Music Project read below or visit us on line at www.dunyainc.org. The concert is co-sponsored by the Faith Quilts Project, which gathers people of diverse faiths to visually express deeply held beliefs through the creation of collaborative quilts. It culminates this April with a Grand Exhibition of over fifty quilts. For more information please visit the Faith Quilts Project on line at www.faithquilts.org. Through music and spirituality, we celebrate the similarities between our faiths and continue to build bridges of hope, trust and understanding. Please invite your family and friends. Sunday April 9, in concert, 4:00 p.m., Queens Museum of Art, Flushing Meadows Park, Queens, New York. For more info please call 718-592-9700. The Gerard Edery Ensemble will take part in the DownTown Seder in New York City sponsored by Michael Dorf. For more information and to purchase tickets please visit OyHoo.com. co-sponsored by the Congress for Jewish Culture. Come on down for the Pre-Pesakh special, and we're having company: guest artists Michael Farkas (The Wiyos) & Jeannette Lewicki (Max & Minka, Zagnut Orkestar). Mo Pitkin's House of Satisfaction features retro decor, theme menu, and for this occasion a satisfyingly long music set: MK's octet will prime you for Passover with new tunes & familiar favorites! The Chassidic Jazz Project performs at The Arturo Sandoval Jazz Club on April 15-16. Sets are at 8PM & 10:30PM. Doors open 8p.m. Show 9p.m. Tickets are $15 for Workmen’s Circle members, and $20 for nonmembers. Get $2 off per ticket if your paid ticket order is received at Workmen’s Circle by the end of the day Thursday, April 13. Sorry, no phone reservations accepted for this concert. We present three world-renowned virtuoso musicians�Yale Strom (violin), Elizabeth Schwartz (vocals), and Mark Dresser (contrabass)—in "Music, Mayses...and Matse?!" in a rare L. A. appearance at Workmen's Circle. Drawing from both traditional and nontraditional Yiddish and klezmer music to celebrate Khol Amoyd Peysekh, these three musicians epitomize world-class performance level in their areas of expertise. 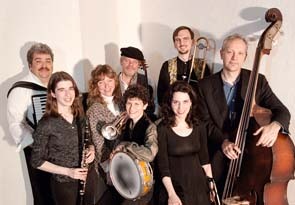 Yale Strom is the world's leading artist-ethnographer of klezmer music and culture; Elizabeth Schwartz is renowned for her timbre and interpretation of new and traditional Yiddish song; Mark Dresser is acknowledged as one of the world's leading jazz bassists- composers and has been playing klezmer with Strom since 1982. On Sunday April 16, the Argentinean Jewish Relief Committee of Greater Boston (AJRC) will hold its 5th annual concert, "Sounds of Argentina 2006" to benefit the Jewish community in Argentina. The performance will feature Argentinean cantors Dudi Feuer (Temple Emanu-El in Florida), Karen Nisnik (Buenos Aires), and Elias Rosemberg (Temple Emeth in Newton), with the host congregation’s cantor - Aryeh Finklestein- as well as widely praised Argentinean soprano Clara Sandler. The concert will take place at 3:00 pm at Congregation Mishkan Tefila, 300 Hammond Pond Parkway, Chestnut Hill. Cantorial, as well as popular Yiddish, Ladino and Hebrew songs will be featured. This concert brings real community entertainment lead by extraordinarily talented and lively voices. The Argentinean Jewish Relief Campaign of Greater Boston (AJRC) was organized in January 2002, as an all-volunteer, grassroots response to the worsening circumstances facing Argentinean Jews. The concert is co-sponsored by Combined Jewish Philanthropies and by the Consulate General of Israel to New England. The proceedings go in their entirety to help the Argentinean Jewish Community. Tickets are $25 for general admission, $20 for seniors and $10 for children and students. For donations or to purchase tickets, send a check to AJRC-CJP, 39 Brighton Ave., Boston, MA 02134 or call 617- 457-8788 with credit card. Tickets may be purchased on line at www.ajrc.org. Tickets will be available at the door on the day of the concert beginning at 2:00 pm. The concert was sold out in the past, so reserving your tickets is suggested. Pays tribute to many of the great clarinetists of the 20th century: Beckerman(s), Brandwein, Epstein, Goldensteyn, Musikers, Pincus,Taras. $12 advance $15 at the door. On Monday 17th April (Easter Monday) at 12pm, The Fireflies duo (Fiona and Ruti) will play in The Round Gallery, Siamsa Tire, Tralee, Co. Kerry as part of the Samhloaicht Easter Festival. Lots of other good stuff going on there too, it's a fab arts festival and worth a visit. Later that day, at 3pm, Ruti is teaching a Klezmer dance workshop also in Siamsa Tire, lots of freilach and bulgar steps for you to take home and practise!! Later that self same day Ruti and Fiona will be reappearing in a completely different county!! At 8pm at Fitzpatrick's in Kilcrohane, Sheep's Head, West Cork. Part of the Craic on the Coast, a great little music festival with fun and seaside galore. Performing solo, with other artists presenting. "Précurseur et fer de lance du courant hip-hop klezmer outre-atlantique, coauteur du sensationnel album "Hip Hop Khasene" avec la violoniste Sophie Solomon et de l'improbable "SoCalled Seder" featuring Killah Priest, Katie Moore, Susan Hoffman-Watts, Frank London et Irving Fields, SoCalled a surgi à Paris en octobre dernier auprès d¹Iva Bittova et du David Krakauer¹s Klezmer Madness lors d¹un concert mémorable au festival Klezmopolitan. 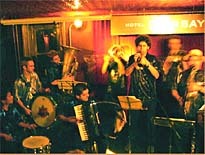 Dans le cadre de sa première tournée européenne d¹envergure, il fait escale à Paris le jeudi 20 avril 2006 au Studio de l'Ermitage et le mercredi 26 avril 2006 au Point Ephémère avec comme invité de marque le saxophoniste Julien Lourau (Groove Gang, Magik Malik, Bojan Z...), à Saint-Etienne le vendredi 21 avril 2006 au Grand Lux et à Marseille le vendredi 28 avril 2006 au Poste à Galène (locations points de ventes habituels). On y découvre sa vision jubilatoire d¹un esprit yiddish nourri de jazz, de rock, d'électro, de musique orientale et surtout de hip hop, style propice aux transgressions de codes et de croyances établies. In just under two weeks,Klezmerica will perform a rare public concert in the city of Minneapolis itself. Our Saviour's Lutheran Church has invited us to perform in appreciation of all the volunteers who make the fine vegetarian restaurant St. Martin's Table such a special treat for its many fans and customers. By April 21, Passover and Easter will be over, and live Jewish music will be great way to celebrate the true arrival of Minnesota spring! Feel free to join Joe Vass, Carolyn Boulay, Jay Epstein, Dave Jensen, Dale Mendenhall, and Chris Bates in this special Klezmerica concert. Dancing is encouraged but not required (no pressure)! Thanks and Chag Sameach (Happy Holiday)! Naftule's Dream is at Ruttman's again this Friday. Again, Andrew Stern will be guest guitarist, with the regular gang. Eric Rosenthal is hot off the road after playing a couple of weeks in Poland with Paul Brody. He heard a student band out in the middle of nowhere, Poland, up near Lithuania, which had transcribed Naftule tunes off the CDs and was playing them on a concert! The Naftule sound has travelled far! Bruce Adler appears in concert at Queens Theater in The Park (New York) at 8pm on Saturday night April 22nd and again at 2pm in the afternoon on Sunday April 23rd. Go to queenstheatre.org or call 718-760-0064 for tickets. On Saturday 22nd April you can see the full four piece Fireflies rocking it up in the Blind Piper in Caherdaniel, South Kerry. Dor L'Dor will appear at the Down Home in Johnson City, Tennessee, on Saturday, April 22, 2006 at 9:00 p.m. Tickets are $12. Breaking the klezmer barrier in upper East Tennessee, this will be the Down Home's first klezmer concert. Move over Bela Fleck and Nickel Creek. keep people happy in between dancing! NOTE: Don't drink too much tequila! 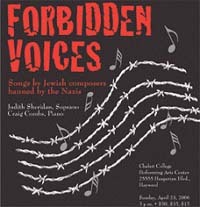 The Chabot College Foundation presents the world premiere of "Forbidden Voices," a concert that showcases rarely performed songs written by Jewish composers whose works were banned by the Nazis. This monumental event is slated for Sunday, April 23, 2006, between Passover and Holocaust Remembrance Day, at 3 p.m. at the Chabot College Performing Arts Center, 25555 Hesperian Boulevard, Hayward, California 94545. Tickets may be purchased at cityboxoffice.com or by calling 415-392-4400. The event is a benefit for the Chabot College Foundation. A portion of the proceeds will be contributed to the Holocaust Center of Northern California. Donors who give $250 or more will receive complimentary VIP tickets, the CD and the opportunity to meet the performers at a back stage event following the program. Contact the Foundation for more information at (510) 723-6802. "a day long celebration and a union of music, arts, science, healing and ceremony"
Location: at the Topanga State Park; Nature Center, Trippet Ranch 20825 Entrada Road, Topanga, CA. 90290, back at the ranch. Admission: $10 for the whole day! Queen's Arts Museum — Pharaoh's Daughter UNPLUGGED @ 5p.m. Tickets are $8 in advance and at the door. And student documentary footage in Sudan. At SP!EL, four guests including Maureen Lipman, Tracy Ann Oberman, Norman Lebrecht and Max Wigram with host David Aaronovitch will chew the fat over contemporary cultural events, surrounded by sneak live previews of new albums, plays, performance and books by visiting bands, actors and contemporary dancers. We will feature a performance from Three Admirers, a newly commissioned piece from the works of Isaac Bashevis Singer, adapted by the award-winning Samuel Adamson and directed by Mark Rosenblatt plus dj Max Reinhardt in the bar after the show. Discussion includes Andy Warhol's Ten Portrait Of Jews at the National Portrait Gallery, the new novel Journey to the land of No by Roya Hakakian and Ushpizin, showing at Screen on the Hill and the Odeon Swiss Cottage. One block west of The Junction (intersection of Hillel Place, Nostrand and Flatbush avenues). IRT #2 to last stop, "Flatbush Avenue." Dr. Demento: "[Yiddishe Cup is] a dizzying combination of retro and contemporary references, and hot music." George Robinson, New York Jewish Week: "I can't imagine what they are like on stage but I'm sure the American Psychiatric Association is watching closely." You are invited to support us in one of three ways! Learn more about giving levels and ticket prices here or for further information, please contact Tim Thomas at 718.852.7755. Made possible with support from the Center for Cultural Judaism, Bertha Effron Fund of the Community Foundation of Dutchess County, Wassermann-Streit Y’DIYAH Memorial Fund of the Berkshire Taconic Community Foundation, and Jazz at Bard. OLIN HUMANITIES BUILDING, ROOM 104, 12:30 p.m.
OLIN HUMANITIES BUILDING, ROOM 102, 5:00 p.m. These internationally renowned artists bring jazz, classical music, and creative improvisation to material ranging from folk songs to contemporary poetry. For information on this or other events of the Jewish Music Forum, please see the website: www.jewishmusicforum.org, call 212-294-8328 orMusic in the Holocaust: Confronting Life in the Nazi Ghettos and Camps (Oxford University Press, 2005) was a runner-up in the Holocaust category of the 2005 National Jewish Book Award. Jeremy Dauber is the Atran Assistant Professor of Yiddish Language, Literature, and Culture at Columbia University. His first book, Antonio's Devils: Writers of the Jewish Enlightenment and the Birth of Modern Hebrew and Yiddish Literature , was published in 2004 by Stanford University Press, and Landmark Yiddish Plays, an anthology he co-edited and translated with Joel Berkowitz, will be published in June. He is the co-editor of Prooftexts: A Journal of Jewish Literary History. Theresa Tova is at the Kleve Stadthalle in Kleve, Germany with a program entitled A little Klez, A little Jazz. Click here for more information. Friday, April 28, Friday night service at Temple Sinai, One Engle Street, Tenafly, New Jersey, for more information please call 201-568-3035. 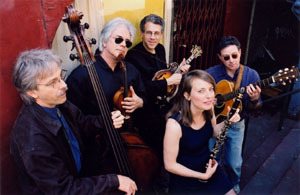 KlezCalifornia 2006 will take place this spring at the Kehilla Jewish High School in Palo Alto. An exciting program is planned in collaboration with The Albert L. Schultz JCC. Located at the corner of Longwood Ave. & Huntington Ave. Accessible by Green Line E train (Longwood stop) or by #39 bus. Letter from Istanbul celebrates the traditional music of Western Anatolia & Aegean Islands. This project grew out of the longtime musical friendship of Derya Türkan and Sokratis Sinopoulos. Letter from Istanbul is a sophisticated melding of traditional Turkish and Greek folk forms such as zeybeks and sirtos. The ensemble includes: Derya Türkan on kemenche, Sokratis Sinopoulos on kemenche (Turkish fiddle) and lavta (short-necked lute), Ugur Isik on violoncello, Hakan Güngör on kanun (plucked zither), Perikles Papapetropoulos, also on lavta, and the Yarkin brothers, Fahreddin and Ferruh, on percussions. Master Derya Türkan is dedicated to continuing the style of his teacher Ihsan Özgen and of Tanburi Cemil Bey. Sokratis Sinopoulos has played in Ross Daly’s Labyrinth Ensemble, with Greek demotika and rebetika groups, as well as Byzantine music and western jazz ensembles. 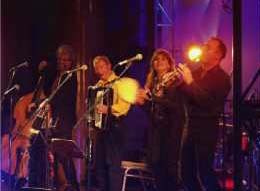 KlezCalifornia will begin on Saturday night with Havdalah, leading into a spectacular lineup concert with the California Klezmer/Red Hot Chachkas All Stars with Heather Klein on vocals, and featuring the internationally renowned Klezmer Band Veretski Pass—heymish and hip! All this will be followed by a spirited dance party, with Steve Weintraub leading us through wonderful and energetic Yiddish dancing accompanied by all the musicians. 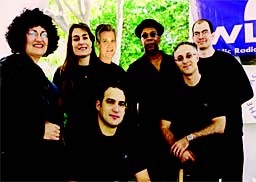 Check the web site for more details at www.klezcalifornia.org. General admission is $25, students, seniors and ALSJCC members $20, children $5. In our auditorium at 3301 Bainbridge Ave. & 208th St., Bronx. colorful and joyful evening of Jewish songs and dances. Sunday April 30, 3:30 p.m., at Anshe Emet, 3751 North Broadway, Chicago, Illinois. For more info please call 773-281-1423. Sunday, April 30th, 9:30am - 6:00pm, Kehillah Jewish High School, 3900 Fabian Way, Palo Alto, held in collaboration with the Albert L. Schultz JCC. Join us for a fun filled day of workshops and classes in Klezmer music for all levels, special presentations and lectures, Yiddish language and humor, sing-alongs, dancing, art, special teen workshops, youth programs for ages 5 and older. Featuring fabulous teachers of the internationally renowned klezmer band Veretski Pass, special Yiddish dance teacher from Chicago, and Stanford lecturers. Check website to get the latest information. Space is limited! Please preregister online or by mail, see web site at www.klezcalifornia.org for details. General admission $20, Students $15, Seniors $15, ALSJCC members $15, children $5.